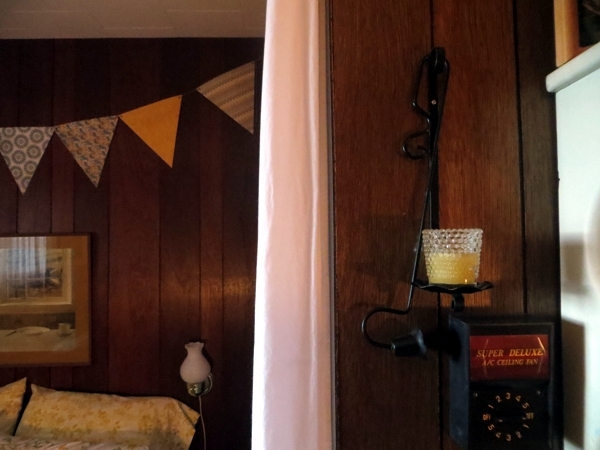 This summer, our fourth with a cottage, was the one that taught me something I hadn't realized about being ready for a power outage. 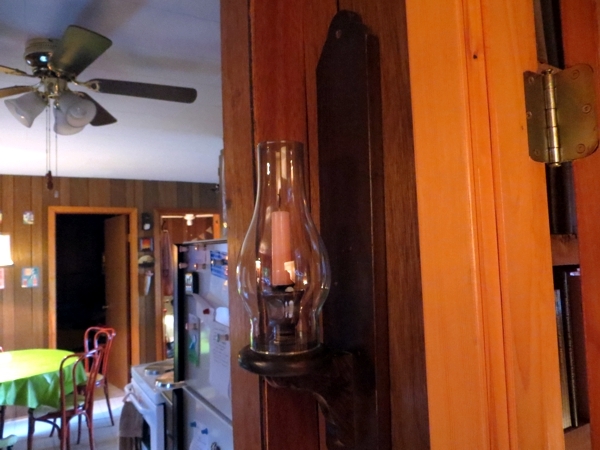 My uncle and aunt spent a lot of summers in this cottage and in others from their childhood too, so they knew the value of kerosene lamps and candle holders with hurricane glass over them. 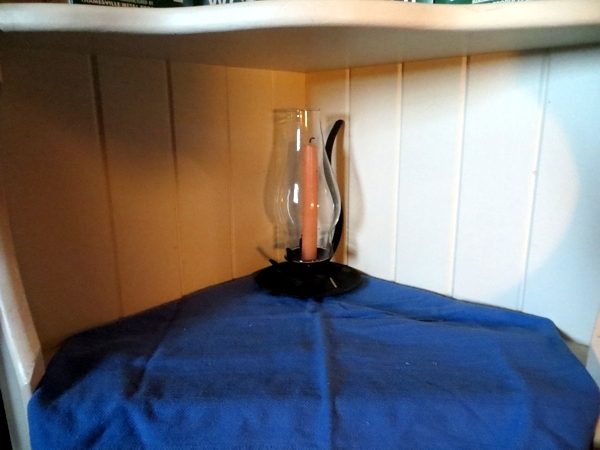 I wasn't a fan of the kerosene lamps myself and gave them to a neighbour, but I never even noticed the candle holder screwed to the wall outside their bedroom until a couple of years ago when I finally got around to washing and dusting the glass. It's such a great idea because the power can be pretty unreliable in our remote and forested location. Normally, we aren't affected by outages. If they happen during the day, we just crack open a book or play cards, knowing that there's plenty of snacks and beverages at room temperature - no need to open the fridge door or pine for boiled water for tea. If they happen in the night, we're asleep. If they last more than a few hours and the food in the fridge spoils - well, we don't keep more than a meal or two's worth of perishables in there anyway, for just that reason. But a couple of weekends ago we were at the cottage during a very heavy run of thunderstorms, one of which extended over the entire evening - the time between dark and bedtime where you need at least a little light. And while we do have flashlights for emergencies or nighttime trips to the dock for starwatching, we don't always remember exactly where we left them. Sometimes we also forget to buy batteries to replace the few that don't work, which reduces supply. So as the storm got louder and the sky got darker and our lights began to flicker, I began to gather candles and matches. Matches in the water- and airtight tall tin, candlesticks in the rectangular red one. My aunt had faithfully wrapped each candle in plastic wrap, which kept any of them from melting onto each other on hot summer days as the years passed. 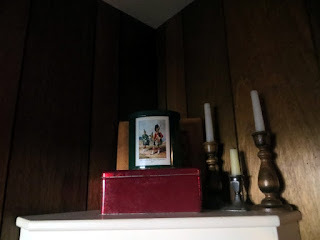 During my search through various drawers for candle holders I found the pair of wooden ones and the small silver one and set them up alongside the tins, to be ready for lighting after dark. I had come across this hurricane lamp few years ago, and set it decoratively at the back of an open shelf in the guest room - I wanted it handy, but I also wanted guests to have a place for their odds and ends. It wasn't until the storm that I remembered it actually serves a purpose. The candle snuffer, placed attractively over the mounting bracket where I can always find it. I really love it when household things can serve more than one purpose, don't you? We did arrange for a gas fireplace at the being-renovated house so we have a heat source if the power goes out there in winter, but I am totally finding spots for wall-mounted candles when our house is all done. 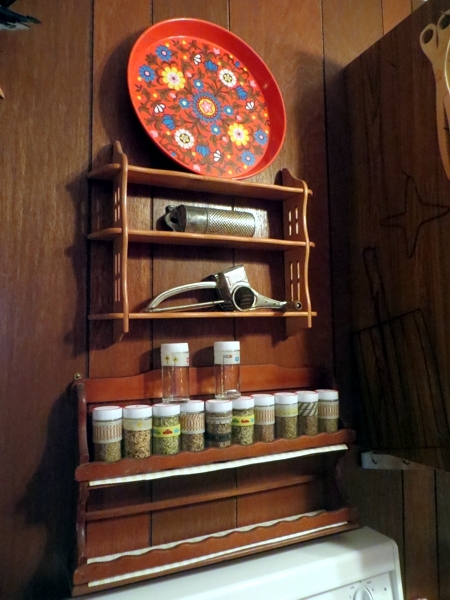 Functional home decor! we all need it.